It’s no secret, I have a thing for wearable technology – and I need whatever help I can get to try to be more active most days since I rather despise the gym and I especially dread the treadmill and elliptical machine. 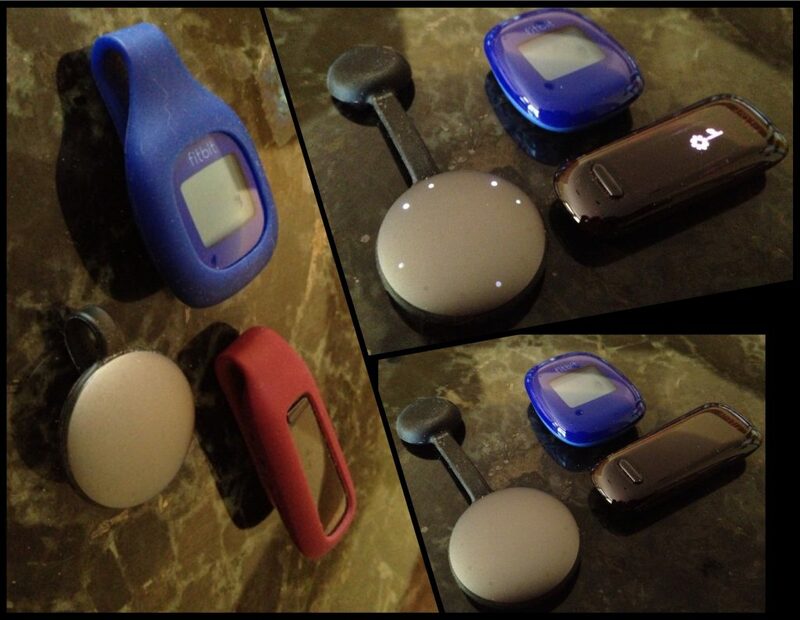 Over the years I’ve had a variety of activity trackers and have even written about them (though I haven’t yet told you anything about the round one in the above photo). Trackers have gotten more sophisticated, and come in different form factors. For the longest time I wore various iterations of Fitbits but I never made the jump to the wrist-mounted ones, mostly because since I ditched wearing a watch years ago, I couldn’t bring myself to go back to regularly wearing thing on my arm – and to be honest, I’m not really fond of how they look. 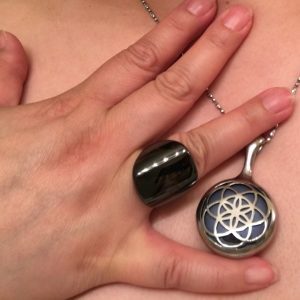 A few years ago, I supported the Misfit Shine on indiegogo – while I really like the sleek not obviously a fitness tracker look, I was not a fan of the default holder (a rubber clasp with a magnet) I eventually sprung for a pendant and a different chain to hold it, and I’ve been much happier. The Shine tracks activity (but not stairs climbed) and sleep – and since getting the necklace/pendant for it, I never take mine off except when the battery needs changing. The Shine does a decent job of tracking activity and sleep (and it also acts as a watch). For me, it was a much better solution than the Fitbits, which I had to remember to put in a pocket or clip to my clothing. The Shine can sync with various other popular apps including Weight Watchers, My Fitness Pal and the Apple Health kit – and while it does have a social media network, it is much less prevalent than that of Fitbit (there just aren’t as many Misfit users as there are Fitbit users). On the rare occasion that I want to be able to track elevation/stairs climbed, I charge up my Fitbit One and throw it in my pack or a pocket. While I’ve been happy with the Shine, it was only a matter of time before I became seduced by another wearable… Meet the Oura Ring – a fancy computer in a ring. Back when the Basis watch was being released, I was awfully tempted to pick one up….but due to the watch format and the need to wear it fairly snugly to take advantage of the sensors, I couldn’t bring myself to buy one – sadly, the Basis was recalled for safety reasons. In any case, wearables have continued to evolve and I eventually stumbled across the Oura Ring – I resisted the lure when it was initially offered via crowdfunding, but I eventually succumbed after being able to read reviews after the rings had been released to the public. The Oura Ring is not inexpensive, but it has a lot more data tracking ability than the Shine. The Oura Ring tracks heart rate, body temperature, activity and sleep (similarly to the Shine, it does not track elevation or stairs climbed). The app is decent and provides helpful tips and insight – best of all if you leave the bluetooth transmission on it will remind you (via your phone) to get up and move if you’ve been inactive for too long! While the does app not give you access to all the raw data the ring is collecting, access may be coming as Oura is releasing a web based API that allows the user to much more of the data that is accumulated. Since wearing the Oura Ring, I find I actually do get up and walk around more because of the gentle reminder to get up and move – some days are harder than others because I’m often chained to my desk for conference calls – but it is still a nice reminder to get up and pace within my little box if I can’t completely get away. As with any fitness tracker, it can sometimes be fooled into falsely detecting activity – the ring curiously detects knitting as low intensity activity, though it does not seem to register frantic typing. I found that both the Misfit and Oura were fairly comparable for detecting walking activity – though the step counts are not perfectly aligned (with the Oura often out-counting the Misfit). 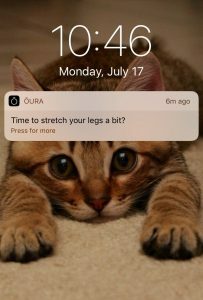 In the case of the screencaptures above, the Oura indicates it reminded me 4 times to get up and get moving during the course of the day (and I rudely ignored it) – and I had spent about 6 hours and 24 minutes in a state of inactivity (terrible, I know). I should mention that I have a set a goal for steps for the Misfit – it just doesn’t happen to prompt me to get up and be active. In addition to giving you a look at how your day is shaping up for activity, the Oura App provides a look at your activity trend. 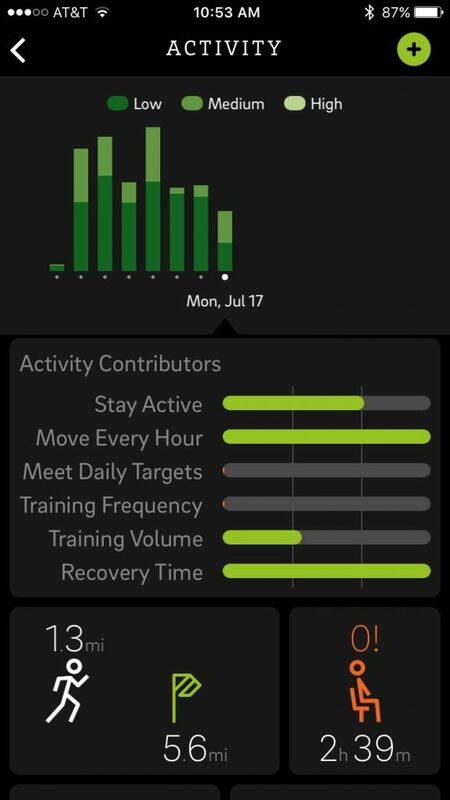 Based on various things including your previous day’s activity and how you slept, the app gives you a recommended activity target – in the screencapture to the left, you can see I haven’t been good about meeting my daily activity target, or training frequency…and the app was recommending that I try to get 5.6 miles of walking in. Both devices also track sleep (as does the Fitbit One, but I never used it for sleep tracking). I find the Oura to be more accurate – the Misfit can sometimes think I’m asleep when I’m not – especially late at night while I’m up reading – and sometimes in the morning on weekends when I laze about in bed with a book. 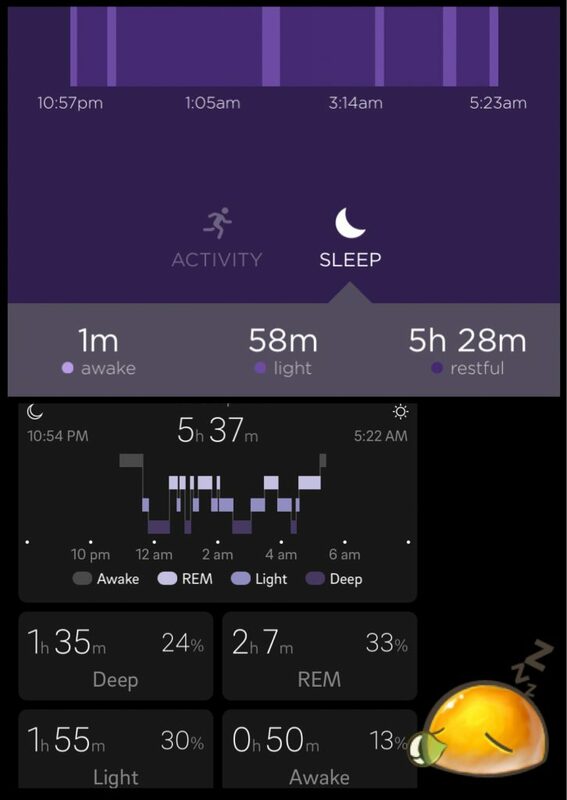 In the case below, it looks like both the Misfit and the Oura were fairly well aligned for what time I went to sleep and what time I woke up…but the Oura provides more information about sleep states. Interestingly, the sleep data from the Oura Ring has been compared to sleep study data and has been found to be comparable – in that aspect it is much more convenient than going through an actual sleep study! As I mentioned before, the Oura collects additional data including heart rate and body temperature, but at this time I don’t tend to pay too much attention to those bits of information. If you’re interested in more in depth reviews of the Oura Ring, I can recommend this review by Ben Greenfield or this one by Alex Fergus. If you’re interested in buying an Oura Ring, I would be happy to generate a discount code for you for 10% off your purchase (just leave me a comment and I’ll email you your code). If you have any questions, I’d be happy to answer them. So far, I’m rather happy I decided to spring for for this ring. 4) right now, it is not possible to access all the data….but that’s coming with time. 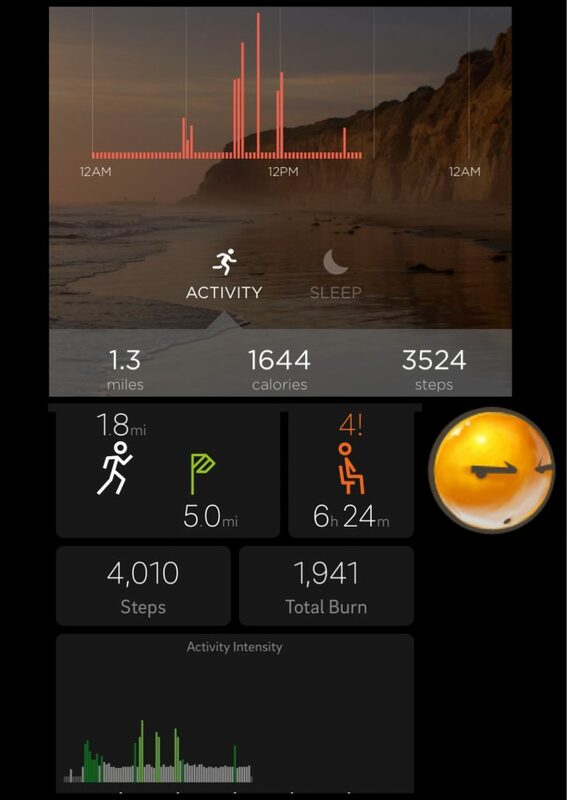 And just a reminder: as with all wearables, it can pick up false steps/activity.